Bonnyrigg Rose AFC came from behind to beat Lothian East league rivals Meadowbank 2-1 in the Ronnie Travers Cup final at New Victoria Park to lift their first piece of silverware this season. Rose warmed up nicely for their South of Scotland Cup final against Hawick Waverley this Friday by bouncing back in style after an opening period which Meadowbank dominated. Meadowbank were unfortunate not be further ahead at the interval, with Rose goalkeeper Steven Parker, who recently became a father for the first time, preventing the scoreline from being out of Rose’s reach with several great saves. He could do nothing to prevent Meadowbank from taking the lead on the half-hour mark, however, after a great team move ended with Paul Martin netting at the front post. Rose pulled level after the break when Chris Robertson headed in a pinpoint Chris Roxburgh cross. They went in front seven minutes later when Paul Waters capitalised on a defensive error to run in one-on-one with the keeper before side-footing into the net. Meadowbank went down to ten men after an off-the-ball incident and, despite throwing everything at Rose in the final ten minutes, they couldn’t find a way past Parker. Meanwhile, Sandys bounced back from two goals down to beat Linlithgow Thistle to secure their second trophy of the season with a 5-3 victory in the Blaikie Cup final. The Premier League outfit found themselves two goals down inside half an hour thanks to a Chris Snedden double. But Sandys bounced back and were level at the interval with Steven Philp and Liam McCardle netting. Philp then got his second to put Sandys ahead for the first time with a delightful strike into the top corner, before Steven Anderson made it 4-2 with a volley. Linlithgow pulled another back through Jordan Rodger, but Gordon Ramsay made sure of the win ten minutes from time. 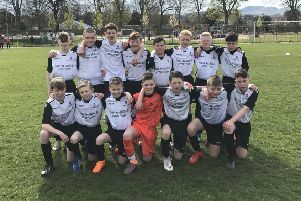 Edinburgh Caledonian lifted their second title in succession and completed another unbeaten league campaign with a 2-0 victory over Stables in the Sunday Morning Division 1 league. Caley had to endure a nervous wait after the full-time whistle to find out they were champions, as they triumphed on goal difference with second-place Tranent held to a 2-2 draw with Pumpherston Thistle in a match they needed to win to secure the league crown. Edinburgh Harps ended their Lothian West campaign with a 2-1 victory over Queensferry Athletic to secure third place with the goals coming from Craig Lamb and John McClarey.